He wrote … My work routine is very simple. And it’s always been the same, for the last forty-five years. I go out to my writing hut at ten o’clock in the morning, and I stop at twelve. In the afternoon, I return for another two hour session from four to six. 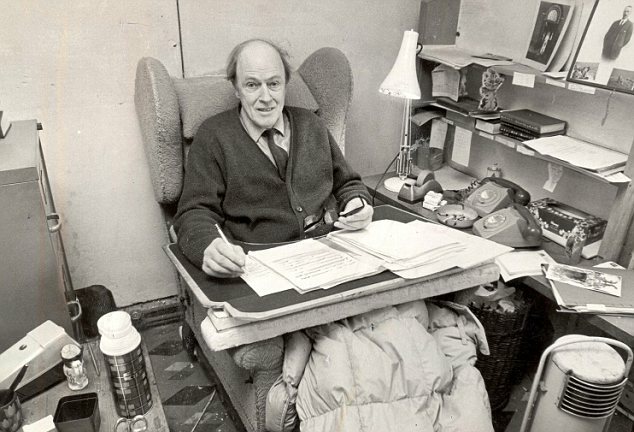 I have a comfortable chair, I’ve got a writing desk. It’s got on it dark green billiard cloth which is very soft on the eyes. I put a roll of corrugated paper under it so that it’s exactly at the right angle. I have an old leather trunk, filled with blocks of wood, to put my feet on. Once you’re in here, you can lose yourself in your work. It is my little nest, my womb. I have always been fascinated by the amazing range of routines and rituals so many writers employ as part of their writing day together with their choice of a working environment. Whatever your point of view I hope you enjoy what follows. You are very kind indeed.Thank you so much. Yes, there were some great blogs at the party.Go and have another drink. Thanks for dropping by. This is effing brilliant! I write in the middle of the night usually, every now and then something strikes me during the day. The challenge is being able to stop everything and get it down. It’s usually poetry that gets me…damn poetry I love it but it’s damned inconvenient to stop in the middle of the quad (at school) drop my book bag and scribble. Thanks for the follow! I followed back…cuz you seem pretty cool and I am pretty cool. Haha have a great day! Fantastic. Yes I am reasonably cool I hope.I look forward to reading your work. Don’t stay up writing too late. But hey… you’re young so just do it. What the heck.Scribbling is great.If you have a cell phone then just record your thoughts on that. All the very best. I have been complaining about my schedule, when my wife asked when I was most at peace writing…at night. Ok, she said, so take a nap during the day and your sleep evens out…duh! I do so love the peace of nightime from midnight to around 3am. Hi. I shall think of you as a night owl then. I like it that you find that peace to write at that time. An understanding wife certainly helps as well.I prefer a day routine myself but when I’m really working hard I just grab sleep and the energy seems to flow. All the very best. Hi there. Thank you for this. Interestingly … Charles de Lint was born in … 1951. All the best. Kris. Love your style. Haven’t quite worked out a schedule yet, but I keep trying. Hi there. Thanks for dropping by. I reckon that schedules are ultimately a matter of self-disipline. Hard to maintain most of the time. Good luck. We’ll both make it. Stay in touch. I am intrigued by the photo. I have no schedule— just write too much— but I truly believe the pain in the back of my neck is a result of sitting wrong. He had the right idea, so I just need to tweek my work area to work with a computer. Hi.Many thanks for your follow. Keep coming back. It is difficult to be comfortable when writing. Some folk say it’s best not to be too comfortable anyway. Hi there Chris. Yes, I have been very tired and hopelessly sidetracked these past months.Slowly getting back into the swing of things though so I should be up and posting again soon. So nice of you to drop by with your kind words. Hope things are going well with you as well. Chris.